“Why do I have to pay for that?” What is free, what isn’t, and why in Haitian Vodou. Both Houngan Liam and Houngan Alistair offer lesyon, or readings. These can focus on a specific area of life or situation, answer a specific question, offer general advice and guidance, and reveal which (if any) lwa are walking with an individual at that particular time. 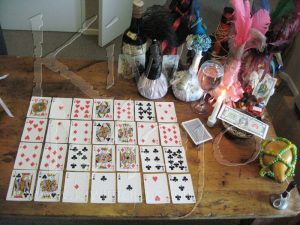 A reading isthe first step in determining what factors are influencing your life and what steps can be taken to improve your chances of success, and is often the first step taken by those setting out on their journey into Haitian Vodou. A lesyon also reveals whether or not that person is called to Vodou, and in what capacity. It will also often reveal if that person needs to undergo initiation. In addition, lesyon will reveal any situations which need dealt with, and any messages the lwa have for that individual. Vodou emphasises that although their may be obstacles in the way of success, there is almost always a way to overcome them. Readings can be performed in person or from a distance, and may be booked directly from our online store. 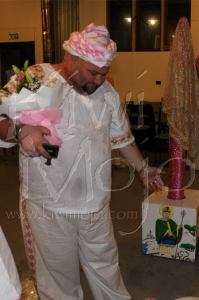 The greatest miracle of Vodou is that we are able to interact directly with the lwa through the process of possession. Not everyone is willing or able to attend a fet where lwa appear, but may wish to speak to a lwa directly. The lwa can see much, much further than humans can, and are able to offer advice, healing, magical work, comfort, help, and sometimes a push in the right direction if someone is losing their way. The lwa will be called onto the head of Houngan Liam, who will usually call upon Met Kalfou to provide the consultation. He is able to call any lwa, however, should a particular spirit want to speak to an individual or an individual desire to speak to a particular spirit. This will be arranged prior to the actual calling of the spirit. Consultations with a lwa never take place solely between an individual and the lwa. There will always be a third person present, a member of the Hounfo who is experienced in dealing with the wants and needs of the lwa. They will ensure that when the lwa comes down they have all their accoutrements, and will assist with greeting the lwa and translation (not all the lwa are fluent in English, and some do not speak at all.) They will also fetch anything required by the lwa if travay is necessary, and will keep notes. They will assist Houngan Liam when the spirit leaves, as possession is an exhausting process. They will also fill Houngan Liam in on any pertinent details afterwards, such as prescriptions for magical work, so the any important issues can be fully discussed. This person will always be a member of Hounfo Racine Deesse Dereyale, most likely Houngan Alistair or Dorian. Discretion will be maintained as a matter of course. It is important to note that when a lwa is in possession of an houngan or mambo, their consciousness is completely gone and their body is fully taken over by the lwa. They will have no memory of the events that occur during possession, and are not in any way responsible for anything the lwa may say or do whilst in possession of their body. Consultations with lwa must take place in person, as they lwa will not interact with people via technology such as Skype or telephone. To arrange a consultation, please email info@kiwimojo.com.